It didn’t take long but I hate myself again. lol. Nice that I can laugh at such statements now. I don’t want my picture in the yearbook and I’m definitely not going to Grad Ball. I wish I hadn’t put my baby picture in the yearbook. I won’t write my grand blurb and I regret buying the yearbook. I don’t want to go to Cegep next year. I just want to be invisible. I want to die. I hate my life, I hate myself, I hate everything about me. I wish I could escape. Indeed, I did not go to Grad Ball or to my graduation ceremony. This is a minor example of several events (or non-events) in my life that I’m tempted to regret, but realize I cannot. The truth is, if I had gone to Grad Ball, I would not have enjoyed myself. I had no friends, not because no one liked me, but because I liked no one, least of all myself. At that time in my life I would have been miserable at such an event. It would have only served as another opportunity for me to beat myself up for my shortcomings. I can look back and interpret this so-called missed milestone as a failure, but if I had gone, it would have been an even worse failure because I would have been angry and disappointed with the way I’d interacted (or not interacted) with others. I can think of many other missed opportunities such as this in my life. Things that might have been, but could not have been, because of who I was at the time they occurred. I often find myself frustrated with where I am in my life, and wish I’d taken action on certain things earlier, as I often feel as though I’m about a decade behind where I should be, or where most people are. A lot of the socializing that most people accomplished in their teens, I did in my twenties. Much of the growing up the typical person does in their twenties, I did in my thirties. Same with my career (both the one I get paid for, and the one I don’t). Yet I cannot blame myself for this slow growth, because I simply didn’t have the capacity to do more earlier, as I was busy working through other struggles. I’m still working through things, as no doubt we all are, and there’s no point in admonishing myself for this. I’m on my own path, no one else’s, and that’s fine. 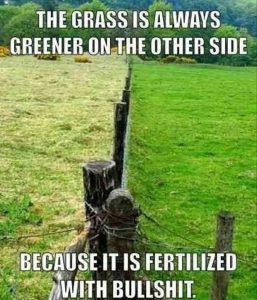 Besides, there are other ways in which I’m ahead of the curve, compared to my peers, so if I’m going to play the “grass is always greener” game, I need to acknowledge how green my own grass is once in a while.